With autumn’s arrival, many people start thinking about their schedules for the coming year. We have a few suggestions for justice-oriented planners and calendars for 2009, and for some important dates to put in them, too. This post will tackle planners and calendars, while tomorrow’s will include important social justice dates and campaigns to be aware of in the coming year. Many people rely on their calendars to tell them which days are important, historic, and worth celebrating. Calendars frame how we view time, seasons, growth, and change. For this reason, I prefer calendars which mark the anniversaries of important strikes, protests, court decisions, and changes in the Earth and lunar cycles. My co-workers and I have compiled a list of some of our favorite calendars, and some we’ve never seen but sound cool, below. 2009 Peace Calendar – According to the Syracuse Cultural Workers, based in Syracuse, New York, the 38th edition of their annual peace wall calendar is “greener than ever.” Printed on paper made from 100% postconsumer waste (PCW) which is processed free of chlorine and dioxin, the calendar is sold without wasteful extra packaging like plastic shrinkwrap and cardboard stiffeners. 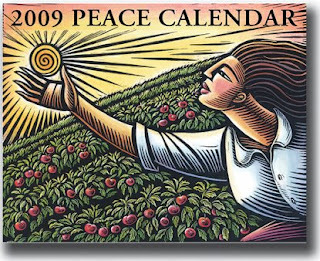 Sweatshop free, made in the USA, and Union-printed, the Peace Calendar is packed with social justice/peoples’ anniversaries, holidays of many faiths, and lunar cycles. 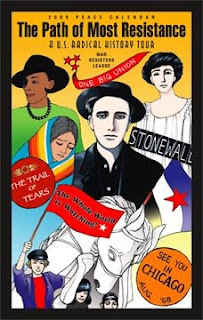 Inside, inspirational art touches on topics including resistance to US militarism at home and abroad, urban sustainability, indigenous women, response to gay hate crime, and the celebration of the 77 year history of the Highlander Center in New Market,TN. Click here for more information. 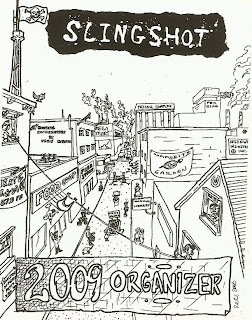 The Slingshot Organizer is produced by an all-volunteer collective–“no bosses, no workers, no pay”–in Berkeley, California. The organizer has a strongly anti-capitalist tone. It opens with an essay entitled, “False Hope, Real Transformation,” which slams the notion that a new leader produced by a corrupt capitalist system can solve the nation’s problems. The essay also sounds the call to “seek forms of organization that re-localize decision making,” and make “our day-to-day existence more meaningful, engaged, and connected with others.” The following 160 pages of the Slingshot organizer mark the forgotten history of people of color, immigrants, indigenous peoples, women, working class people, and members of queer communities. Also included are a list of radical bookstores and infoshops, information on sexuality, transgenderedness, interacting with police, and a calendar for recording menstrual cycles. Click here for more information. Includes a directory of U.S. peace and justice organizations and publications, and international contacts. Click here for more information. Features radicals & rebels for every day of the year. Last year’s “saints” included Audre Lorde, Frederick Douglass, Karl Marx, Friedrich Nietzsche, Frida Kahlo, James Joyce, U.G. Krishnamurti, Emma Goldman, Eugene Debs, Jesus Christ, Albert Einstein, William Blake, Cesar Chavez, Bob Marley, and more, with short bios on each one. 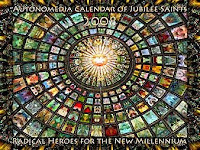 Check the Autonomedia online bookstore for the 2009 calendar release date, which may not be until December. Now that you’ve got your radical calendar, now what? 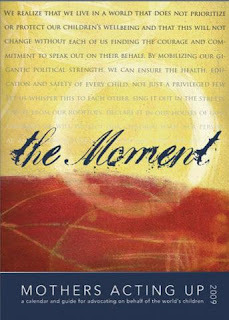 Check back tomorrow for a schedule of UUA Advocacy & Witness social justice campaigns for 2009.